Ahh Mansfield, my home town but enough of being sentimental. We (as in I decided and everyone followed and then claimed it was their idea as usual) to go on the train to Mansfield and took the route stopping at Worksop and then travelling down on a different train from there. The journey dropped us off just on the edge of a large bridge and I was wondering all game if we could see the ground from where we were going to get off the train and it was quite literally just at the other end of the bridge so there was no problem there. We had gone quite early so we decided to have a quick look around Mansfield and were generally greeted quite well with smiles and everything, also the occasional dirty looks, this was a local derby after all. We all went into the pub after having some lunch nearby and played pool and fussball, it was a rather nice pub but I can't remember the name of it now, it was at the bottom of the hill. We tried to leave at around half one but were told that we couldn't leave as they wanted to avert as much possible as possible. So in other words, City fans could go in but they couldn't leave. We went to sat outside in the garden thing and noticed the gate was open so we went out that way and go up to the ground. 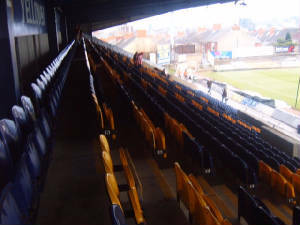 After finally getting the away end, it felt like you were lost because you emerged into an area with no side stairs or anything so you have to walk along a long row of seats . 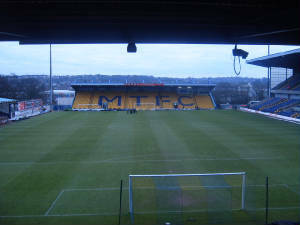 The stand we were in was quite good although like most other "new" stands, had a very plastic feel to it, a big blue stand with "STAGS" in big yellow writting and it was an excellent view of the playing action. There was good leg room and I was suprised that they decided to change this end to make it the away stand rather than the home stand it had been in recent seasons. The stand to our left wasn't being except by the media. 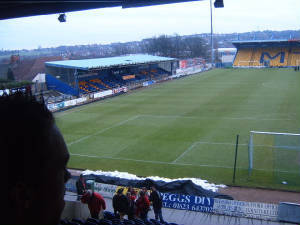 The far stand was the one away fans used to occupy, this was also a good stand which provided an excellent view of the action although was a bit smaller than the stand we now occupied. The final stand was a large (for this level of football) two tiered stand which holds roughly 6,500. This stand was very nice with a good colour scheme and the atmosphere came from this stand from all the local hooligans. 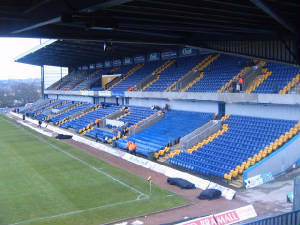 My fondest memory of the limited atmosphere at Field Mill is in the 2003/4 season when in the 3rd minute, they were chanting "E I E I E I O" and half way through, our player smashed the ball in from 35 yards and shut them up. The amtosphere at Filed Mill is near enough non-existent and even worse when they're losing. 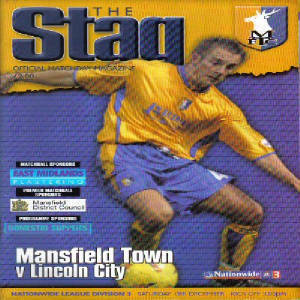 I would recommend Mansfield to any fan as it is a worthy addition to the 92. I certainly hope to visit this ground many more times.